Angola and Libya Poised for Human Rights Council, Georgia - Russia Fight Next Year? UNITED NATIONS, May 12 -- There are only 14 candidates for the 14 seats on the Human Rights Council up for election on May 13. Despite opposition from some groups and requests by others, this almost certainly means that each of the 14 candidates, including Libya and Angola, will get elected to three year terms on the HRC, a body which last year converted a draft condemning the Sri Lankan government's murder of civilians into a final resolution praising the government. 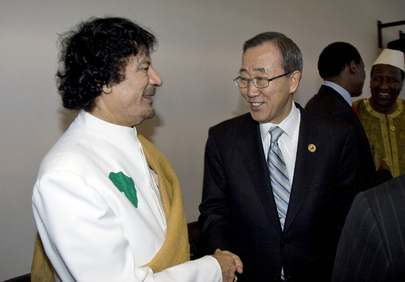 In Libya, political opponents are imprisoned and disappear. In Angola, poor people are summarily evicted to make way for projects, while oil revenue continues to disappear. There are only two examples. The one contested race that loomed for May 13 involved Iran running for a seat. 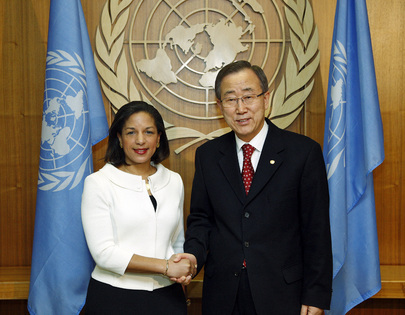 The country withdrew, however, in exchange for a spot on the UN Commission on the Status of Women. Click here for Inner City Press' Q&A with Mahmoud Ahmadinejad about how Iran would use that seat. US Ambassador Susan Rice, being criticized for not opposing this Iran seat, may speak on the topic after Thursday's vote. 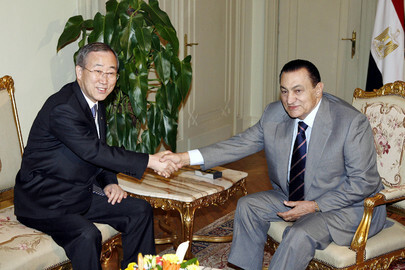 In the run up to the election, Inner City Press asked the representatives of two NGOs calling for the casting of empty ballots what they thought of the place of human rights in the UN since Ban Ki-moon took over in 2007. "Kofi Annan was good on these issues," replied Tom Melia of Freedom House. "That's my answer." Inner City Press: Sure, Jean Victor. There was a presentation here in the UN by two NGOs about the upcoming vote for the Human Rights Council, countries to be on it. Among other things, they were urging, you know, I guess Member States, to vote against Libya and some certain other candidates for it. But it was unclear since the regional, and I couldn’t really get a straight answer from them how this would work, if the regional groups put forward only you know, two names for two African slots. If in fact a country like Libya were not to receive the 97 affirmative votes, what would be the procedure to actually, to fill that slot? I mean, what is, is being named by a regional group an automatic that you get the seat or is there some, do they have some basis to say that by choosing not to vote, this would somehow reopen it and another country could be elected? Inner City Press: The vote is for two spots, with only two candidates. What happens if people choose not, just choose, as these two NGOs were urging, not to vote for one of the two. Then…? Spokesperson: There are many votes in the General Assembly and in other organs, and in other proceedings of the UN when you have a limited number of candidates or in some other instances, many candidates. So, we should really not make a pronouncement on this very specific case. I will not comment on the particular of a specific country. Inner City Press: [inaudible] I’m asking about the procedure, because they seem to be urging people to simply not, you know, not vote, and that this would somehow, you know, this could have an effect, is what they were saying. They were also saying that if people write in another country, that under the GA rules that is not supposed to be recorded as a vote for another, for somebody that is actually not on the ballot. But they say that it is. Spokesperson: Well, this is lobbying by NGOs. This has nothing to do with Member States, per se. But, I will still ask the questions, and we will try to find out on the proceedings side. But these are proceedings that are set and that have to be implemented for the time being. I really see no procedural problem that might have been infringed, per se.